The streets of Istanbul are lined with pistachio nuts. Yes, literally. Many of the roads here are cobblestoned so when people get done shelling a pistachio nut they throw the shell on the ground and you see many in the cracks of the cobblestones. I’m a huge fan of pistachio nuts so Ive been looking forward to our trip to Turkey since the best pistachios come from the Middle East. The silly embargo the U.S. has on Iran has cut off the flow of quality pistachios into the States, a boon to the inferior California pistachio nut industry. Pistachios are everywhere here, roasted and salted in multiple sizes and are also used liberally in the honey-laced pastries you see everywhere. I’ve gone a little overboard with my consumption so I asked my Persian friend Mitch at what point does it become unhealthy to eat pistachio nuts. His reply: “All in your mind. Just keep eating.” So I have. 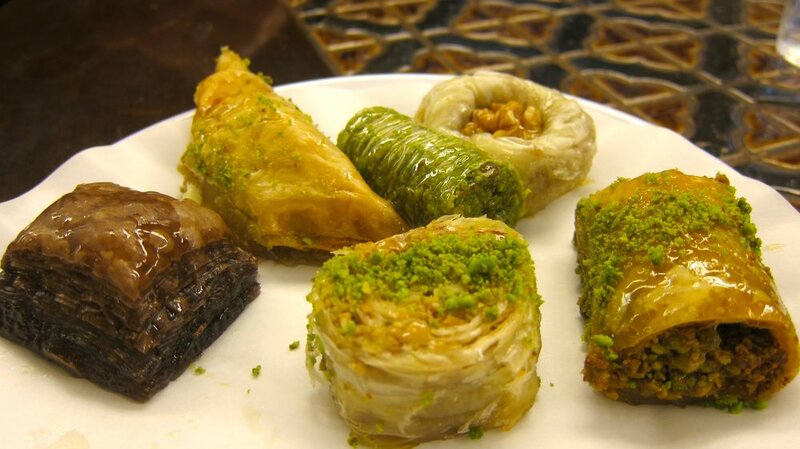 A local baklava plate - four of six including pistachios. The other thing you find in abundance in Istanbul is fresh pomegranate juice. You can find carts filled with pomegranates throughout the city and juice shops are everywhere. Costs vary depending on whether you’re in a heavily touristed area or not, but we found a guy by where we’re staying who sells a small glass for 1 Turkish lira (about 50 cents). So good! Our local juice vendor. He's seen us a few times this week. Restaurants with spit roasted chicken and lamb are everywhere and the sandwiches are quite cheap, around 7 lira apiece ($3.50 in case your math isn’t good). Kebabs are prevalent as well. We ordered a kebab plate for two the other night and my eyes lit up when they brought 19 kebabs to our table along with the many assorted add ons. What a feast. As with most countries you can also find Western fast food franchises like Burger King and McDonald’s and Starbucks. While we were here, a New York-based hamburger chain, Shake Shack, opened in Istanbul. After 10 months of mostly eating foreign foods, we have no shame in admitting we ate there. One of our best finds (OK, Jill found it) was this little coffee shop off of one of Istanbul’s main avenues. Turkish people drink tea predominantly, but Turkish coffee is big as well. The coffee is strong so we ordered it medium-sweet with a little sugar. You have to stop drinking before you reach the sludge at the bottom of the cup. A hot, sludgy cup of Turkish coffee. Our livers are getting a much-deserved break in Turkey due to the high price of alcohol here. High taxes are the culprit in this Muslim country. Our host here recommended we go to a Turkish “speakeasy” for a drink, but we left after we were told that cocktails were 35 lira ($17.50) apiece. Beer isn’t too expensive but isn’t very good. We’ve bought a couple of bottles of cheap Turkish wine in a liquor store for 15 lira. We’ll get back on track in a few weeks when we head to Tuscany.